TWD-French Yogurt Cake with Marmalade Glaze and Green Egg and Ham Cups for St. Patricks Day! Today's Tuesdays with Dorie recipe, French Yogurt Cake with Marmalade Glaze, was chosen by Liliana over at My Cookbook Addiction. Mine don't look like a yogurt cake with glaze because I chose Dorie's Riviera version which uses greek yogurt or strained plain yogurt, olive oil and then either rosemary or mint. I had fresh rosemary and wanted to try these with the minced rosemary mixed in with the sugar and zest. I decided to make these in a muffin tin so they would bake faster (20 minutes) and for portion control. The overall taste was wonderful. My 2 year old really liked them-she ate more than her fair share, but I guess that is my fault for leaving them right within her reach on the countertop. 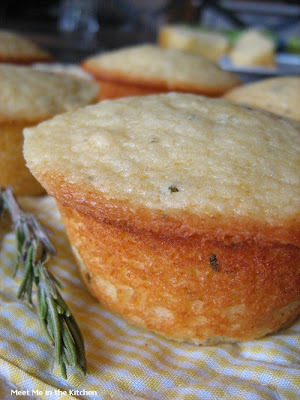 The combination of the lemon and rosemary in a sweet muffin/cake was very good. Go check out what the rest of the TWD bakers did by checking out the TWD Blogroll! 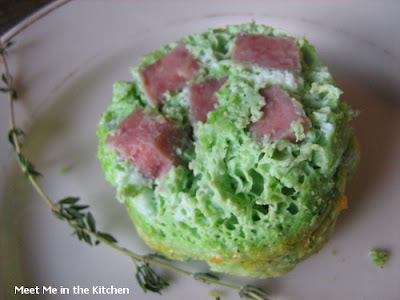 I also made Green Egg and Ham cups because my kids love green eggs and ham. I only do this on St. Patricks Day because I think it looks sort of digusting, but the kids love it. Usually I just do scrambled eggs and add green food coloring and ham, but this time I decided to bake them in the oven and I added spinach and thyme. The ham sunk to the bottom but that didn't matter, the kids loved them. Happy St. Patricks Day- I hope you are wearing green! Whisk eggs in a large bowl. Drop in food coloring and whisk until combined. Add cheese; season with salt and pepper and add ham. Stir well. 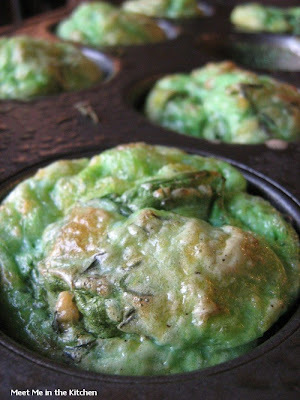 Spray a muffin tin with cooking spray or brush with melted butter. Scoop 1/4-1/3 cup egg mixture into each cavity of the muffin tin. Place a couple of spinach leaves in each cavity and submerge with your finger or a spoon. Sprinkle fresh thyme leaves on top. Bake for 11-13 minutes. Cups will be puffed and cooked through.